There are two types of needles, those in steel and those in bamboo, wood, cactus or plant fiber . Most of steel needles have to be used only for one side of the disc. With the weight of the reproductive of course the disc wears out. The material – schellack, a kind of resin - is softer than steel. But the needle itself wears out too and use it several times damages the disc. There are needles that may play several faces - 10 , 20 or 50. Their using is rather discouraged except if used with an electric turntable which reproducer is lighter. Bamboo needles and other plant fiber needles can be sharped –. see under sharpeners – so that needles can be reused several times. To illustrate this, here are some pictures: a needles tin with 5 compartments offering needles of diverse sound powers . Given the amount of needles, we better understand their unique use. Small boxes include a statement regarding the number of use: « 10 plays alongside discs », but especially « USE ONLY ONCE EACH NEEDLE » and also similar texts in French or German . 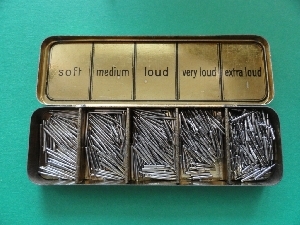 Some compartments tins are equipped with one compartment for « used needles » which opens at the back with a trap to throw the udes needles away. Other large boxes for example in papier mâché or wood also have a waste compartment while this simple tin states: Nur für gebrauchte Nadeln . We also find steel needles in specific forms, like a bell, or with a collar or wavy. Bamboo needles are triangular in shape and should be used only on a specific machine. But there are carved bamboo needles for a player that would not have the desired level of support or a small independent support form . The illustration also shows a needle vegetable fiber (red), cactus (green) and wood. Finally , three sapphire substrates for playing phonograph cylinders and a sapphire ( Stem ) to playback discs Pathé with vertical etching.